This is a large yet relatively compact house containing 5 bedrooms, 5 bathrooms, 3 living areas, a gym, sauna and indoor pool plus garaging. 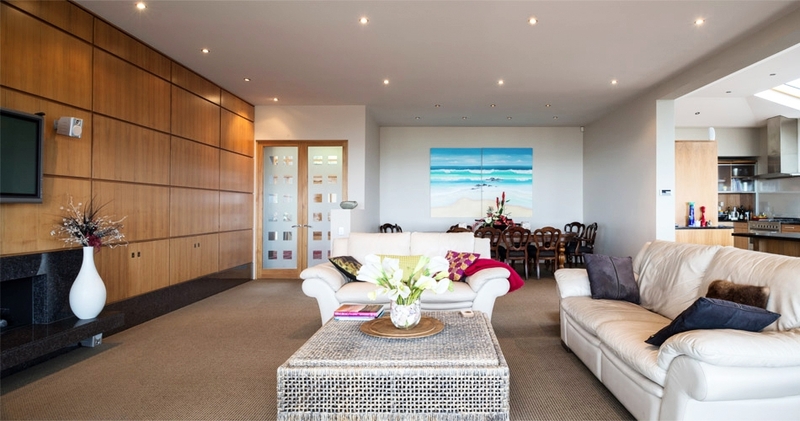 The site has superb views over Tahunanui Beach to the Tasman Bay and the mountains beyond. The rooms on both levels open out to large terraces and decks facing to the north and west.A main feature of the house is a two storey entrance atrium creating a central focus to the house from both inside and out. This space features a two storey high glass wall facing east; roof lighting is also used in this area and extensively throughout the house to bring in daylight and sun. Curves are used to soften the exterior form of the house in roof forms of the upper roof as viewed on approach to the house and from the beach, as well as the roof over the poolroom.The swimming pool is contained within its own building linked to the house and opens out onto its own exterior courtyard through large sliding doors.